After years of web development, I finally get to polish up on my software development skills with the building of this system. YUM stands for Yayasan Usaha Maju, a government agency in the agriculture arena. I was helping a person who needed a system built for YUM co-op's loan facility as a proposal for his Masters degree. The second and main part of the project is the client/server application. The application uses the same database that the web-based system uses. Not only can one submit new applications in this system, but one can also process approvals and print out different reports based on one's customised reporting needs. 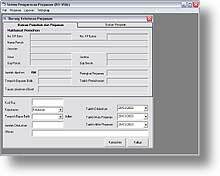 The tools used are Visual Basic 6.0 and Crystal Reports 9.0. You may click on the View link above to view the snapshots and flowcharts. Tools & skills used: Microsoft Visual Basic 6.0, Seagate Crystal Reports 9.0, Active Server Pages (server-side VBScript), Microsoft Access 2000, Internet Information Server 5.0.